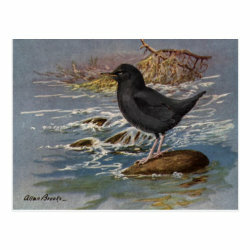 This is a beautiful reproduced illustration of an American Dipper by Canadian bird artist and ornithologist Allan Brooks. This remarkable water-loving bird drawing is a More... detailed portion of a larger work that also included wrens. This vivid painting reproduction of an iconic North American bird is a great gift idea for anyone that loves birds!